As you would expect, working in frontline health services has been just a touch busy these last few days/weeks and so my Xmas post to you is actually being written on Xmas day - I have to thank the present Mrs S for being so tolerant of my obsession! She admits that as far as mid-life crises go (I'm 48 years old) this is better than getting into motorbikes, golf or getting a girlfriend! In fact I have to thank her for a whole lot more - her Xmas presents to me were the fulfilment of several long standing Xmas puzzling wishes. She okayed and paid for (sort of) a few of my most recent puzzle acquisitions, all of which I have been desperate to obtain for a very long time! At the top of the post is a VERY special hand-made puzzle from the Grandfather of twisty puzzle modifications, Tony Fisher. 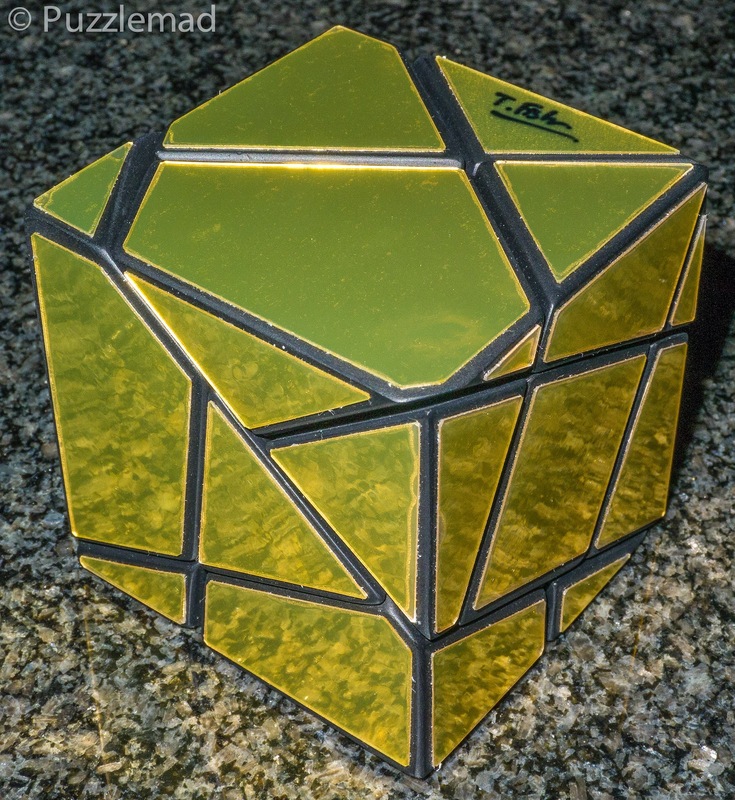 The original Golden cube was designed first in 1999 but only unveiled at the Dutch Cube Day in 2002 and finally mass produced by Uwe Meffert in 2009. 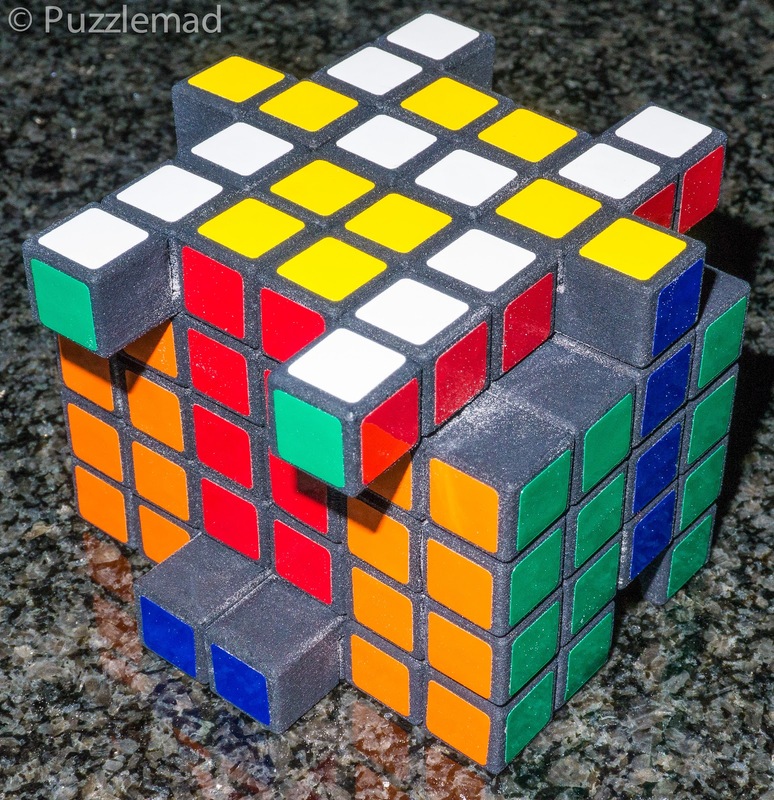 It is a simple Skewb but with the "ghost cube" modification added to make all parts different and to offset the pieces away from their final positions to allow turning. They have long since sold out and they now only are found at auction for many $100s (one sold for over $800!) and have always been unobtainable for me. Very recently Tony announced a new run of handmade versions would be available in very limited numbers - of course I had to have one and asked Mrs S' permission to spend a fairly large amount of money - she said it would be part of her Xmas present -Yay!!! Finally a week or so ago, I finally got my hands on it and it was put away until today. Frankly, it frightens me to death - it is just a Skewb but oh, so much more difficult than a standard Skewb! This new version has been called the Golden cube extreme by Tony because it has been "corrected". The original mass produced version had an error in production which meant that they were slightly easier than he originally intended - this version has corrected that slight shape error, hence the "extreme" label. At last I have a Golden cube and it's a Tony Fisher original too complete with covered signature!!! Thank you to my lovely wife! 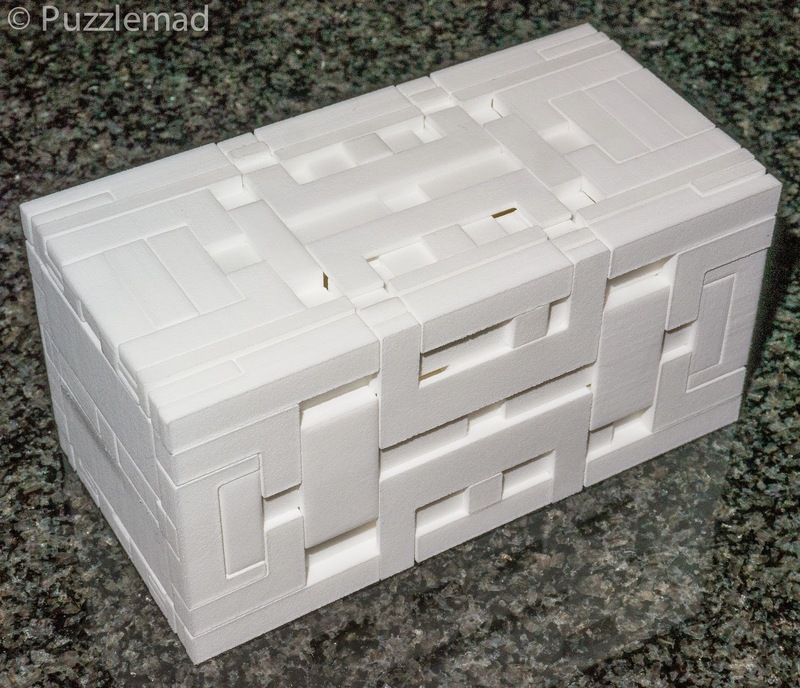 I was very excited when the godfather of puzzle blogging, Brian Pletcher, announced that he was working on reproducing the incredible Stickman Borg Box in printed plastic. I was not sure whether it would ever be possible but after the initial announcement, he showed off his amazing baby and then asked if others in the puzzling community would want copies! As you all know by now, I do not collect puzzle boxes unless they have something else special to them (N-ary or sequential discovery) and the Borg box has been one of the few boxes I have lusted after for quite a few years but when they have come up at auction the prices have been way way out of my reach! I contacted Brian about getting a plastic one and wanted to wait a while before getting one - my hand was forced by the great Shapeways Priceapocalypse when all multi piece prints effectively trebled or quadrupled in price and it arrived just last week. Mrs S squirrelled it away for Xmas! I will not be allowed to play with dye and I'm hopeful that my friend Adin, who did such a wonderful job on Allard's copy can be cajoled into doing just one more copy! What do you say Adin? 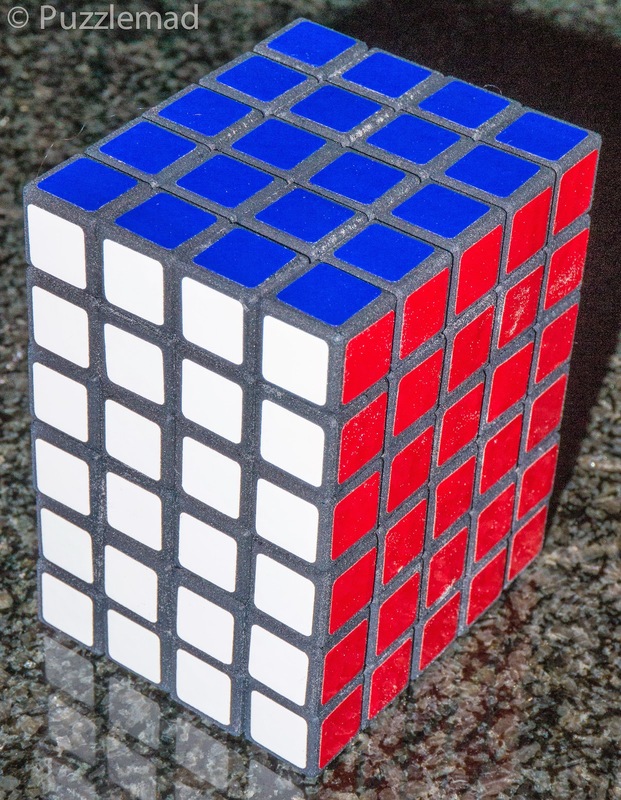 The mass produced ones have been the 2x3x4 and the 3x4x5(both by MF8) and they are both wonderful challenges but I have longed for a bigger version for ages. I actually met TomZ at the London IPP and expressed a wish to buy this puzzle at a later date from him when my finances had recovered from the IPP hit but again the Shapeways death blow put a stop to it! Until a puzzle friend Austin announced on the Puzzle Photography Facebook Group (join us, we have a fun time) that he had a spare one available for sale. Again, I groveled to Mrs S and another puzzle was added to my Xmas present pile. It arrived just days ago and I can't wait to play. I think I will need to play at work rather than at home as there seems to be quite a bit of powder in it (look closely at the pics!) and Mrs S will not be happy if I drop powder everywhere/anywhere! Thank you Austin and Mrs S! 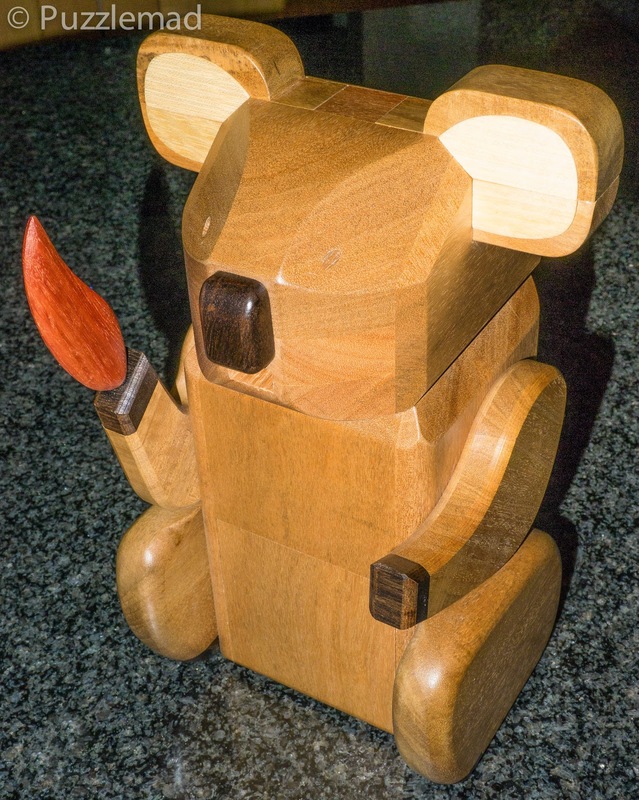 Katie Koala - the greatest discovery puzzle ever made! Finally and not one of this year's Xmas wishes but one of LAST year's ones - I am addicted to the work of the amazing Brian Young - MrPuzzle and when he announced and started selling his 20 year anniversary limited edition, I immediately jumped and ordered one despite the price! This was a mammoth task for him and Juno to work on and I knew it would be quite some time before my batch would be available. It was my hope that it would arrive in time for Xmas this year - and it did! I have had mine for 6 weeks now and have managed to find only the first few tools and managed just the first few steps! What an incredible puzzle!!!! Thank you Brian, Sue and Juno! So finally, I hope everyone has a great Christmas and gets lots of puzzles to play with. Remember that puzzling doesn't have to be a solitary thing - we are a community, so make sure you share and spread the joy of puzzling. Even with the present Mrs S, this puzzling is still something we do together (as long as there's no jingling!) and allows us to chat and be companionable whilst we follow our own hobbies. Thanks to John Legend for these words - perfect in every way! Hopefully you'll get it from the "waiting" list! So 'painful' that my brain 'ruptured'?